The 3 Thailand golf courses designed by Ronald Fream are Panya Indra Golf Club in Bangkok, Windsor Park Golf Club (formerly Panya Park Golf Club) also in Bangkok, and Mountain Shadow Golf Club (formerly Natural Hill Golf Club) near Pattaya. The Panya Indra Golf Club was developed by Fream in 1991 comprises three separate 9-hole championship courses, each with an individual design. 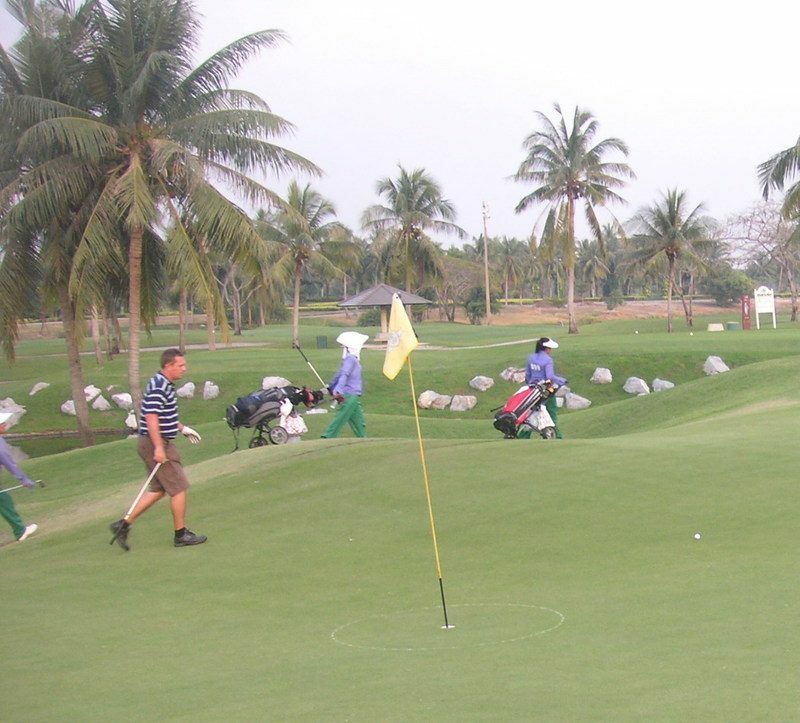 It is the only one of the 3 original Panya Group golf courses that still bears the Panya name. The golf course has been extensively landscaped with flowering plants, shrubs, and bushes to provide a beautiful backdrop. Fairways and greens make use of extensive undulations to add to the challenge. The par three holes are perhaps the most testing aspect of this course as every hole requires a tee shot with full carry over water. There is also a great dog-leg hole on each of the three nines. Course conditions are always excellent as this course is mostly patronized by Mr. Panya’s wealthy business and government Thai golfing friends. The caddies are in particular outstanding as they all have been hand selected, are well-trained, and extremely helpful. Windsor (formerly Panya) Park was designed and created in 1993. It now comprises four 9-hole courses, the last being opened in 2006. It is set in extensive park land on the outskirts of Bangkok. The course features mature tree lined fairways, many green side bunkers, sweeping creeks and ponds, and sloping greens. Although the layout is quite short, which means that the most accurate competitors will prosper, Fream has brought water into play on almost every hole. The smooth flowing lines of fairways give the course a natural feel. It may be small, but all aspects including design, challenge, beauty, and playing conditions are in harmony making Windsor golf ideal for all players. The most recently constructed 9 holes (course D), present one of the best challenges in Bangkok, set out around a man-made lake and requiring very accurate tee and approach shots. Undulating close cut greens make this nine a real test and scoring well can be very frustrating even for the best golfers. Mountain Shadow Golf Club, formerly the Natural Park Hill Golf Club, was re-opened in 2004 after a complete renovation. Located ear Pattaya, Mountain Shadow is a very pretty course crafted out of a former mango plantation with beautiful flowers and trees providing a backdrop to every green. Utilizing water hazards, dog-legs and four island greens to good effect, the relatively short 18-hole course is well suited for golfers of all levels. Greens are fast and generally have large undulations making reading the correct line especially important. The narrow palm tree lined fairways make it a challenge to recover from errant tee shots. Adding to the difficulty is the relatively long distances between the tees and the fairways. Shorter tee shots often wind up in the difficult-to-hit-out-of semi rough. The 6th and 14th holes are especially challenging, being dogleg par 5âs with greens tucked behind huge water hazards. Careful approach shots are required to avoid a watery penalty. If anyone is interested in playing the Ronald Fream Thailand golf courses, please let me know at my Thailand vacation company and I will be glad to arrange it for you.